How Does The Sun Drive The Weather? Airport Design Advice: Engineers Needed! Students will be able to use their understanding of wind, breezes, and climate in order to solve a real world problem. In an on demand writing assignment, students are asked to provide advice to JFK International Airport about runway design based on their understanding of wind and climate. Critical thinking and application found here! Gather, read, and synthesize information from multiple appropriate sources and describe how they are supported or not supported by evidence. I begin every class by asking the students, "What are you going to learn today?" 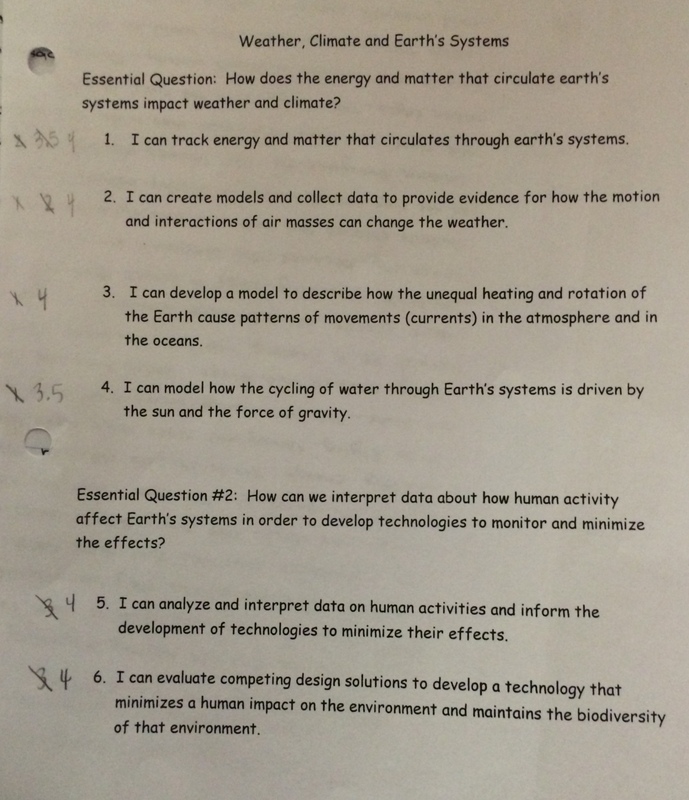 Students respond by referring to the Essential Question, "How can I demonstrate science and engineering literacy?" This EQ is included on their Unit Plan and on the front board. In the previous lessons, my students have used a combination of videos, articles, and labs to search for evidence to make a claim. I explain that in this lesson, students will be given the opportunity to do this independently. Show the students the How does the Sun drive the weather? Website. Explain that they will be answering the question by following the links provided on the site. Show the students that these links will take the students to articles, videos, a cartoon and a procedure to a lab. Emphasize to the students that their goal is to develop an understanding of how the Sun drives the weather. It is important to note that one of the links on the website asks students to complete a lab about specific heat. 1. Fill one beaker with 200 ml of water. 2. Fill one beaker with 200 ml of sand. 3. Place both beakers over a Bunsen burner and put on a pair of goggles. 5. Make a data table to show the temperature of the sand and water over a six minute period. In your table, include a row for Time 0, 1, 2, 3, 4, 5 and 6. 6. Record the temperature for time 0 (the starting temperature). 7. Light both Bunsen burners at the same time. Record the temperature of each beaker every minute for 3 minutes. 8. Turn off the burner and continue to record the temperatures for the next 3 minutes. DO NOT TOUCH THE BEAKERS! They are very hot. Mrs. Roehm will help you take them off the stand when you are finished. So that you can get a visual of the information that students may gather, below is an example of a student's T Chart, created during their research process. 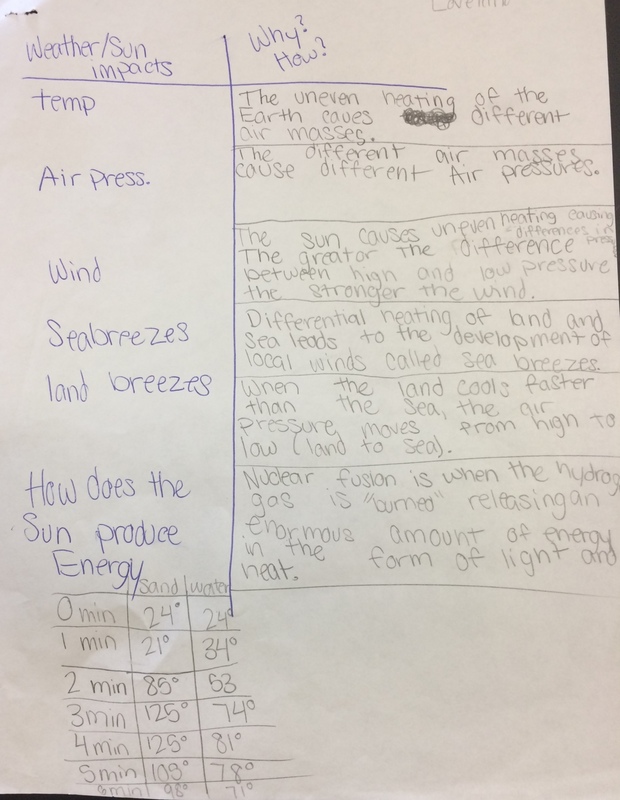 After students have gathered information about how the Sun's energy can drive the weather, I have students complete an "on demand" writing piece that allows them to demonstrate their understanding. I project this picture of JFK International Airport. I explain that JFK International Airport is looking for engineers to help them plan their airport. The airport executives want you to know that airplanes must take off and land into the wind. They need help planning the directions that their airplanes should take off and land. They want some clear direction on which runways to use, the directions to take off and land in, and if these would be the same all of the time or if they would change. I explain to the students that they have access to all of the information they gathered, the T chart they created, and the links that were compiled on the website in formulating their advice to the airport. I explain to students that they will be independently writing an "on demand" ABCDE paragraph to explain their advice to the airport. Then, I provide them with time to write. The ABCDE paragraph is a format for writing that my students have a lot of practice with. There are detailed explanations of each letter of the acronym in the resource "A Quick Guide to the ABCDE Paragraph". I will give you a warning. This is challenging. Students will be frustrated. At the start, some will stare blankly at their papers. They may feel frustrated. However, this is an opportunity for students to work through a critical thinking question independently and show you what they really know. Encourage them. Let them know that they can do this. And, when students get to that point of frustration, give them the hope that the answers are in their research and graphic organizer. Build them up by explaining that they can take time to go back to their research, the websites, and the articles in order to find their answers. Also, encourage them to start putting into words what they do know. Then, they can let that guide their advice to the airport. While I encourage you to support and encourage, resist the urge to give them "hints". I use this response as a summative assessment. It is a way for me to gauge what they can complete independently. I always feel like this assessment gives me insight into what each student really understands and can apply. In the video, I go through a few examples of student work and focus on the ABCDE format as well as some common successes and challenges that students will face as they write. The closure for this lesson should take place after you have graded their written responses. Students need feedback after an experience like this. And, I have found that this feedback is much more beneficial if it comes in small group conference format rather than simply writing comments on their papers. While I do write comments on their paper, I save myself time in grading by not writing the same thing over and over. I know you have all been there. You start grading a paper, and you end up writing something such as "Cite text" or "Use data" 30 times for your 135 students. As I notice these patterns, I simply sort the papers into stacks of students with similar areas of improvement. Then, when I call the group together, I can ask them to find in their paper where they, for example, "cited text". As the group searches and realize on their own that they don't have that, they can really connect to the feedback and see what they need to do differently. So often I have found that the person writing the comment and doing the editing is the one that is doing the learning. If I am always the one finding these errors, I am the only one learning. By calling small groups that have similar areas they need to work on, they can be the ones developing their own understanding. You might be thinking, "That seems overwhelming." Or "If I have to meet with 10 groups, I will never be able to teach the next lesson." My advice is - don't meet with 10 groups. These groups of similar learners are not based around small pieces of advice; they are formed based on direct evidence of the learning target. When forming these groups, form them around big ideas and concepts that tie directly to what you are trying to assess. For those little things, write your comments on their paper instead of meeting and conferencing. Writing this paper isn't the end of the learning for me. Even though it is summative, it is all about growth. Learning is a journey and students need time to reflect on specific feedback so they can learn and grow.